In today’s digital world, marketers know that creating quality content is key to informing, engaging and inspiring action, as well as building authority and rapport with their audiences. And oftentimes that means creating original pieces and assets that tap into their audience’s interests, address pain points and answer burning questions. But let’s face it: marketers are busy—and creating quality, original pieces that get results and position your brand as having the best answer is incredibly time intensive. However, there is one tactic that can come to the rescue: content curation. Simply put, content curation is all about finding, gathering and sharing the best and most relevant content the web has to offer on a specific topic that your audience cares about. First off, you’re likely already doing it in some capacity. According to Curata, more than 83% of marketers curate and share content from third party sources with their customers or prospects. Secondly, content curation can add value, quality and credibility to your content marketing efforts and your brand. Curata also reports that over 50% of marketers say content curation has increased their brand visibility, thought leadership, SEO, web traffic and buyer engagement, and 41% of marketers say the number of quality or sales-ready leads increased, too. Whether you’re thinking about adding content curation to your tactical mix or looking for ideas to boost the quality of your curation efforts, below we offer some best practices, tips, tool suggestions and some examples of how brands are doing it. #1 – Identify sources you can go back to over and over again. Remember that content curation is all about finding and sharing the best of the best content that’s out there, so take time to find and document credible, quality sources that you can consistently pull from. This will not only ensure you’re sharing the best stuff, but it’ll also increase your efficiency. As another tip, consider conducting your own poll or survey to collect insights that can be rolled into other pieces of content. Stay focused on just a handful of different topics and themes that are relevant to your audience. This will ensure that your curated content resonates and show that your brand or company has is knowledgeable and dialed in on those subjects. #3 – Give credit where it’s due. You know that time, resources and a little love went into creating all the pieces you’ve curated. So whether you’re sharing on social media or working the content into a blog post, make sure you’re giving the original writer and/or publication credit for their hard work. #4 – Commit to consistency. If you want your content curation efforts to be successful and effective, consistency is key. In addition, this tactic needs to be integrated into your overall content marketing strategy. The frequency and curated mix that’s right for your brand will depend on your industry, overall marketing strategy and goals, but 2-4 curated social media posts a day and a monthly blog roundup could be a good starting point. #5 – Give your “people” some special attention. Your customers, prospects and partners are likely creating some great content. Highlight that content to show them you’re in touch with their business and help you serve up relevant content to your audience. #6 – Share on multiple channels. #7 – Utilize curation and distribution tools. 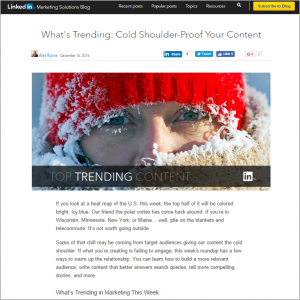 Each week, the LinkedIn Marketing Solutions publishes a “Top Trending Content” blog post focused on what’s happening and what’s being talked about in the marketing world. Below is a shot of one of their latest posts. BuzzFeed is a champion of curated content, utilizing a variety of sources to compile silly, interesting, newsworthy and timely posts each day. While the example below isn’t exactly hard hitting news or focused on helpful tips, it definitely employs a number of content curation best practices such as utilizing social sharing platforms, crediting sources and focusing on a specific topic their readers will enjoy. Big brands and companies aren’t the only ones who can find interesting and relevant content to curate for their unique audiences. There’s also opportunity for smaller and niche businesses to do it, too. Innovatech Labs is a materials testing lab that uses several analytical testing techniques, which are useful to many manufacturers who want to ensure product quality and cleanliness. 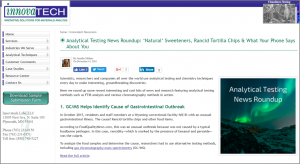 Each month, Innovatech Labs publishes an Analytical Testing News Roundup featuring interesting articles that showcase how those techniques are being used in the real world. TopRank Marketing’s social news feeds feature a hearty mix of commentary, photos, links to original content and, of course, curated content links. 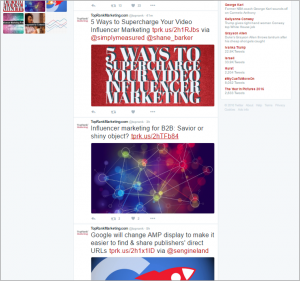 Here’s a peek at our recent Twitter posts, highlighting great content from some of our favorite sources. HubSpot’s “The Ultimate List of Marketing Statistics” is a great example of content curation at its finest. 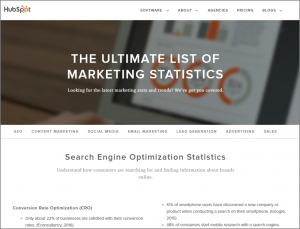 This resource features the latest marketing statistics and is organized by tactic. In addition, it’s continually updated as new data is released. CMO.com by Adobe provides a great mix of curated and original content. In fact, their tagline says it all: “Digital marketing insights, expertise and inspiration – for and by marketing leaders.” The big way they’re featuring curated content is through their “Marketing News Feed,” which pulls in posts from authoritative and credible sources such as Social Media Today, MarketingProfs, Marketing Insider Group and even TopRank Marketing Blog. 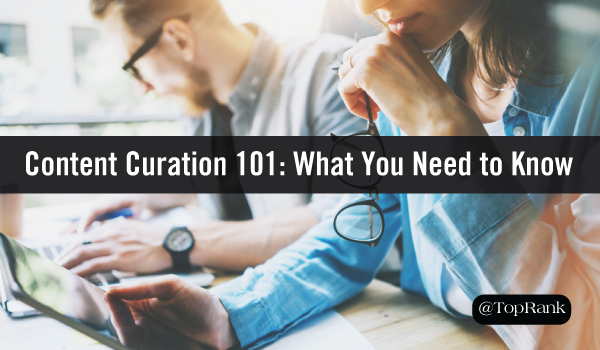 Do you curate content? How often are you doing it and where do you find inspiration for it? Tell us in the comments section below. Disclosure: LinkedIn and Innovatech Labs are TopRank Marketing clients.